My love of art began as a child growing up in Manhattan where I was inspired by the beauty and cultural diversity of New York City. As a young adult, I developed artistic skills and new techniques while studying drawing and painting with several talented instructors at some of the most renowned museums and galleries in the city. Travel to Europe, several Caribbean islands, Mexico, Belize, Venezuela, Canada, and throughout the USA provided opportunities to experience varied life styles and cultures which have helped shape my direction as an artist. The incredible beauty of life in so many places trained me to develop an eye for detail and to sense the “feelings” of different peoples. My first efforts on canvas displayed an early interest in landscape painting. Study with Mary Ann Goetz at the Woodstock School of Art helped refine my landscape efforts. And while I enjoyed landscapes, I soon found my work shifting to a more chiaroscuro style as I began the study of portrait and still life painting at the Art Students League of New York. Intrigued by the work of Caravaggio and Rembrandt, I developed my interpretation of this “old masters style” under the expert instruction of David Leffel, a modern proponent of the method. Courses with Leffel were stimulating and productive. Further study at The Art Students League included work with Raymond Kinstler, a nationally known portrait artist. Working with Laffel and then Kinstler enhanced my skills and helped develop a sincere appreciation for classical realism. I felt myself being more and more drawn to portrait and figure painting. During the past several years I have studied with Rob Liberace and Danni Dawson at the Art League School in Alexandria, Virginia. Liberace is especially talented at drawing all subjects and portraying the human figure in action. Dawson understands and is a master teacher of concepts of color and places an emphasis on developing the capability to paint all manner of subjects, from portraits to pets. I recently completed a series of animal paintings as well as several portraits of a wide variety of persons. 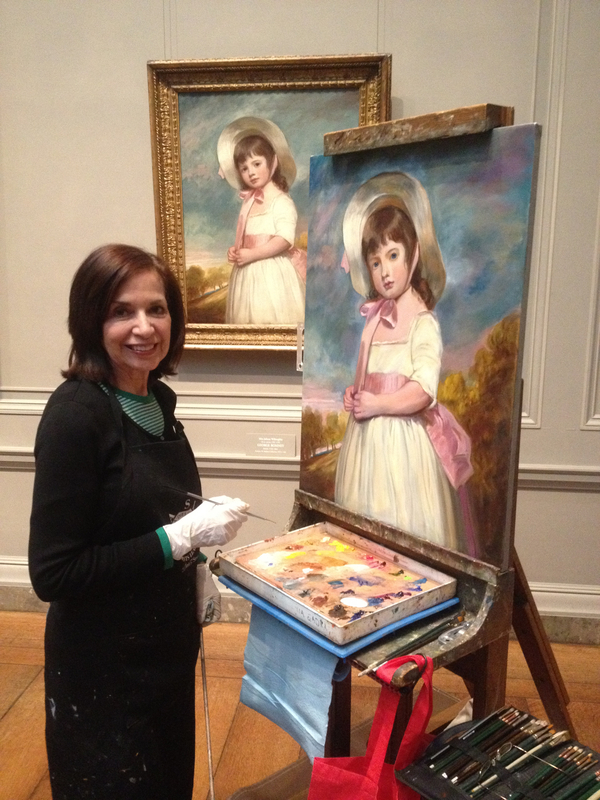 Being selected as a copyist at the National Gallery of Art (NGA) in Washington, DC. was truly an honor. At the NGA I have copied works by Degas, Van Gogh, Velasquez, Romney, Monet, Renoir, Cezanne, and Matisse. I also served as a visiting copyist at the Metropolitan Museum of Art in New York City. It was thrilling to be a copyist in the city of my youth. There is a certain electricity in the air when one is surrounded by works by the greatest of the masters. I love it! And I am so humbly grateful. Certainly, I have a fond place in my heart for classical realism. However, in truth, I love to paint anything. Leffel admonished me to “paint beautiful things.” Dawson convinced me that to be a successful artist “you must be able to paint anything.” My works are now in collections in Maryland, Virginia, Louisiana, California, New York, Hawaii, Puerto Rico, England, and Germany. The many instructors in my life have taught me well. Thank you all. People’s Choice award winner of the Frederick County Art Association’s member’s shows in 2008, 2012, and 2015. Selected for exhibit in the Crestwood Women’s Center Gallery (several months running); The National Center for Children and Families Art and Soul Auction, spring 2011; Art at the Mill, Berryville, Virginia (several exhibits) 2012 – 2015; International Nurses Society Conference, Addiction and Art, Washington, D.C. 2012. First Place winner of the International Nurses Society Conference Addiction and Art Competition in Washington, D.C.
Torpedo Factory, Alexandria, Virginia, monthly feature exhibits (4 selections). Ms. Gadra is a member of the Frederick County Art Association, The Delaplaine Visual Arts Education Center, Frederick, Maryland, Maryland State Art Council, MAP (Maryland Art Place) and The Alexandria Art League in Alexandria, Virginia. She may be reached here. I am impressed by both your paintings AND your rich background of training in several of the art forms. You forgot to mention your experience as an airline stewardess……which also gave you a “world view”!